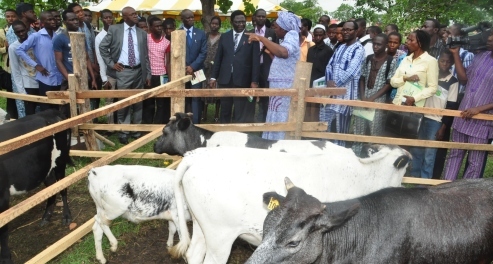 The Vice-Chancellor, Federal University of Agriculture, Abeokuta (FUNAAB), Professor Olusola Bandele Oyewole has called on financial institutions in the country, to give credit facilities to graduates and other young school leavers, who are committed to self empowerment and wealth creation through farming. Professor Oyewole made the call last Wednesday when he paid a courtesy visit to the Ogun State Commissioner for Agriculture, Engr. Ayobami Olubori. Making reference to the University’s Graduate Farming Employment Scheme (GRADFES) and the Community Based Farming Scheme (COBFAS), Professor Oyewole disclosed that some of the institution’s graduates have already embraced farming while a chunk of undergraduates are also showing interest. He pointed out that while such products of the University, under the GRADFES were given soft loans and other benefits as motivation, several others in the society who are willing to go into farming are being daily constrained by lack of fund. Professor Oyewole called on financial institutions, to in the spirit of corporate social responsibilities extend loan facilities to potential farmers who are graduates. The Vice-Chancellor also called on Government to divert more resources towards engaging graduates, especially in the areas of vocational skills and extension services. Disclosing the purpose of his visit to his host, Professor Oyewole said, “I want to let you know what we are doing in FUNAAB and to brainstorm on how we can move the State forward”. Presenting a slide on the University, the Vice-Chancellor said the vision of the Institution include; to be a centre of excellence in knowledge generation for local, national and global development and sustenance; to operate a Land-Grant University with an active town and gown relationship, as well as to train people for local, national and global challenges, among others. Professor Oyewole revealed that the University has an academic staff strength of 562 and Non-Teaching 421. According to him, undergraduate students has a population of 11,624 and post-graduate 1,101 students adding that, 34,000 candidates applied for admission meant for only 3,500 students which we have just increased to 3,700. He reiterated FUNAAB’s commitment to becoming a world class Institution through “a world class agenda”. The Vice-Chancellor stated that the world class agenda revolves round the provision of exemplary leadership, commitment to quality and international collaborations and partnership to promote teaching, research and extension services. He told his host that “our University relevance has gone beyond the nation. We have not only gone global, we are making impact in Africa”. For instance, through our Foreign African Scholarship Scheme (FUFASS), we have been training Agricultural personnel from Sierra-Leone, Liberia and Gambia. “If we can be rendering that kind of services to foreigners, I see no reason why we can’t do it for our own people, since charity begins at home”. He stressed, “I am happy that we have been impacting our people in many ways, one of such is through COBFAS. We are re-orientating our students and our people at the grassroot through the Scheme. Professor Oyewole explained that the rationale behind COBFAS is “to ensure that our graduates are not those that will go to Ikoyi or Lekki to look for job”. In his response, Engr. Ayobami Olubori congratulated the Vice-Chancellor for his new appointment describing it as well deserved. He pointed out that the Ministry of Agriculture and FUNAAB has a pivotal role to play in boosting the socio-economic development of the youth and the nation at large through wealth creation. Earlier in his Opening Remarks, the Permanent Secretary, Mr. Ayodele Koleade disclosed that the visit was a right step in the right direction, saying that the Ministry hopes for better synergy with FUNAAB.